On this Labor Day 2015, I will labor for a while (a short while) to provide some thoughts and related images on our recent visit to the fascinating city of Barcelona, Spain. Barcelona, the City. There’s lots of sources to learn more about the founding of the city, one of the true world capitols, and once a major part of the Roman Empire. What we found in 2015 was a thriving metropolis that melded old and new rather seamlessly. From our room at the cool, modern Hotel Jazz, we could see laundry hanging from balconies of nearby apartment buildings and walk to a new, efficient metro station or 17th Century church in two minutes. Plazas were shared by kids on skateboards and retirees enjoying the mild evening weather. In neighborhoods, we watched people of all demographic groups interacting. The city evolved without losing its soul. Barcelona, the People. Yes, it’s in Spain, but the people of Barcelona identify themselves as Catalonian, an independent and autonomous community with its own language, culture and heroes. Those we encountered — from the dancing waiter at a modest tapas restaurant, to the insightful tour guide during our day trip to the Roman town of Girona and the Salvador Dali Museum in Figueres, to the policemen always willing to provide directions in the labyrinth streets of the Gothic Quarter – were warm and engaging. We did not encounter any rude behavior. Barcelona, the Culture. 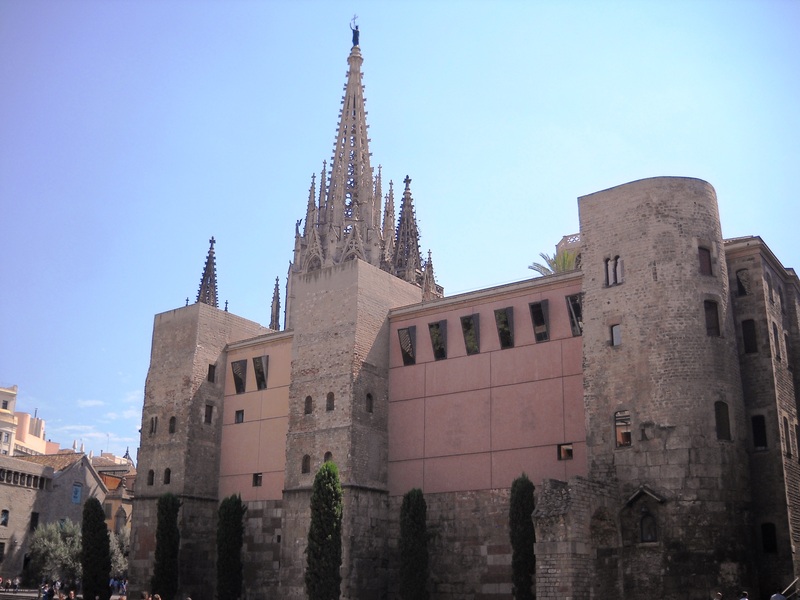 As you’d guess, there’s lots of culture in Barcelona – much of it with the many fabulous museums and grand apartment and office buildings, marketplaces, parks, churches and boulevards. In this densely populated city (as the case in other European towns, we saw few, if any single-family detached homes), restaurants and cafes are seemingly everywhere. Almost every meal we had was good or outstanding. 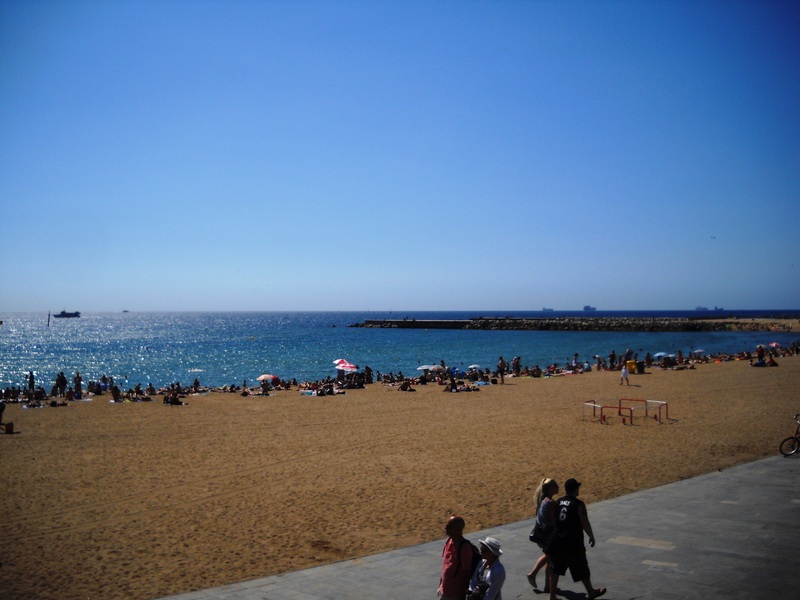 There’s a beach culture comprised of sunbathers of all shapes and sizes, including clubs where men drink wine, talk and play dominoes with a view of the Mediterranean Sea. And, of course, Barcelona is the home of architect Antoni Gaudi, whose Art Nouveau masterpieces are truly enthralling. Barcelona, the Olympics Heritage. 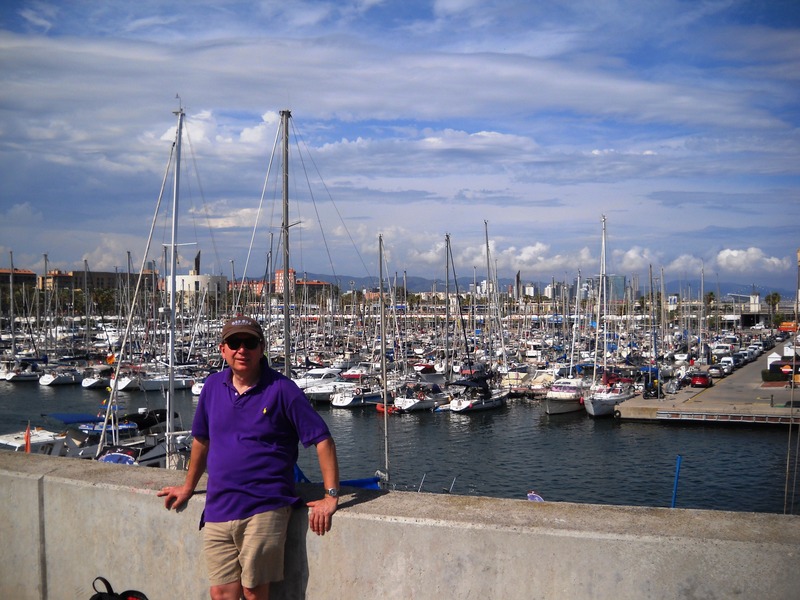 I was inspired to visit Barcelona after watching the Opening Ceremonies for the 1992 Summer Olympic Games held there. (I know: It only took 23 years.) One recollection was the lighting of the Olympic flame by an archer in a wheelchair. A very cool and dramatic statement. The Olympic Stadium and Flame, set within the Montjuic Park, made for a memorable visit on the last of our seven days/nights in Barcelona. 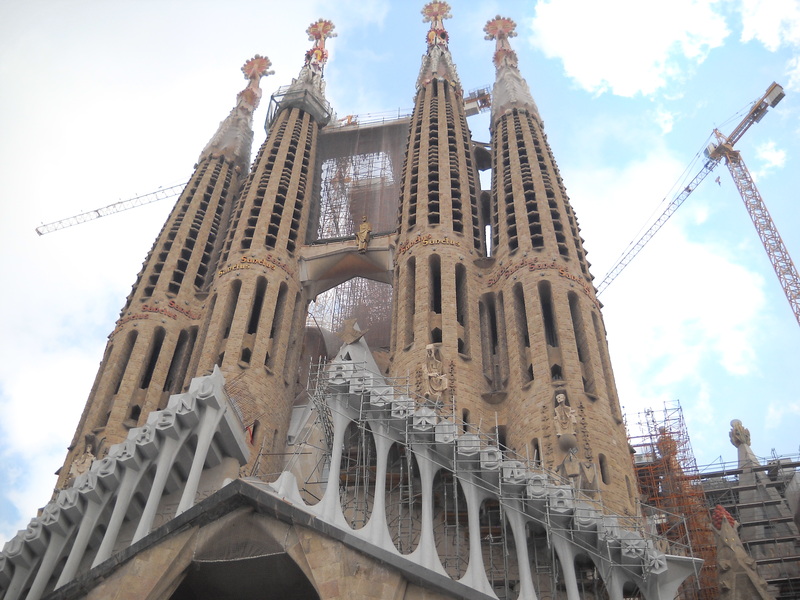 Had to include an image of Sagrada Familia, the Gaudi cathedral still under construction. Beautiful weather, an awesome harbor. Hard to find a better waterfront. A street in the Gothic Quarter, the Palau Musica Catalana at left. A view of the Catedral. The Romans built some of the foundation. The Olympic Flame. 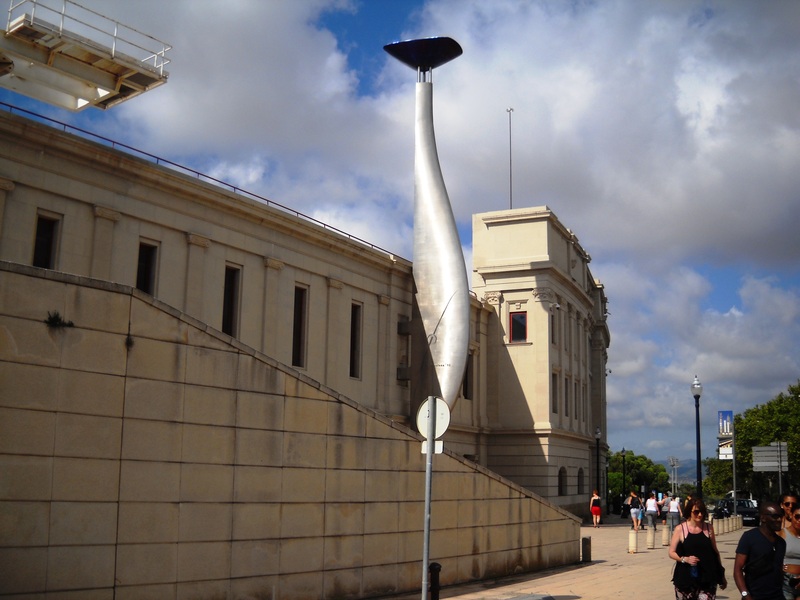 Seeing the flame being lit in 1992 inspired my interest in Barcelona. Didn’t see any surfers, but the beach still is the place to be. 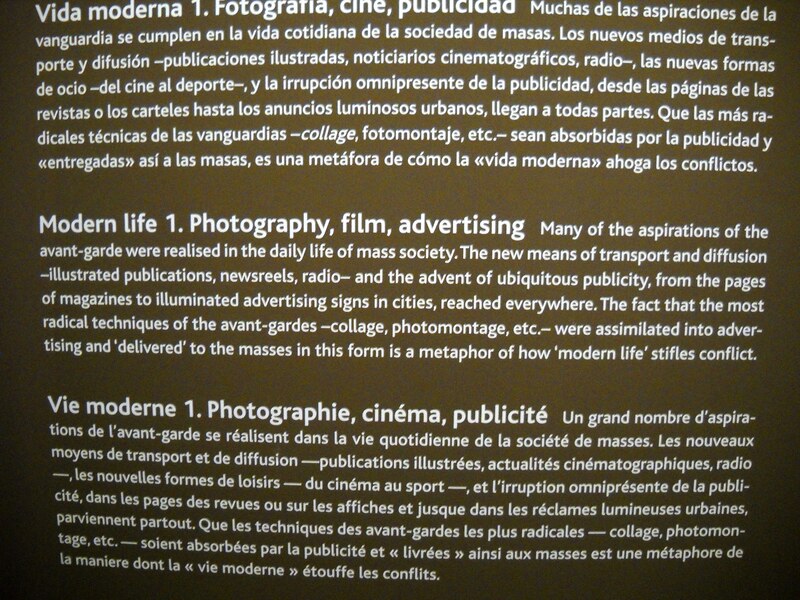 Note this description (in English, center, unless you can read Spanish or Catalan) of the impact of mass communication on society. 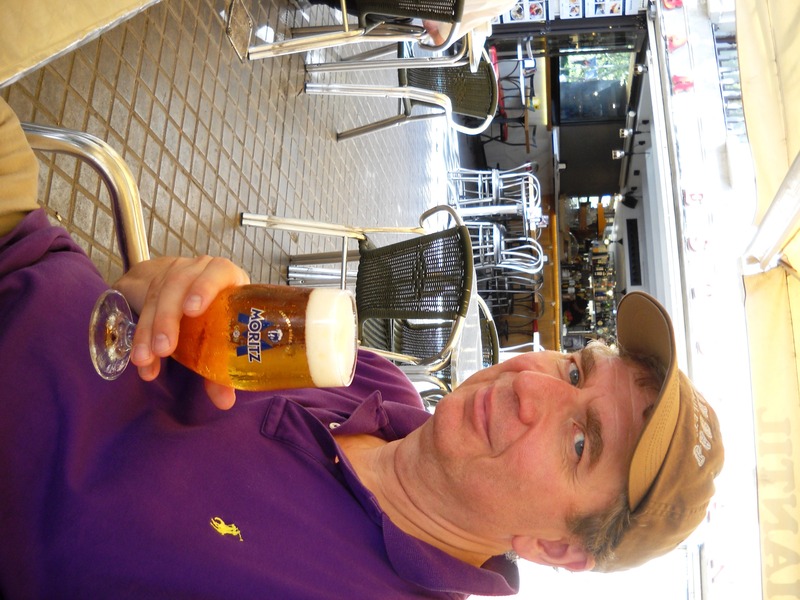 My birthday photo, at our favorite cafe off the Universitat de Barcelona plaza. 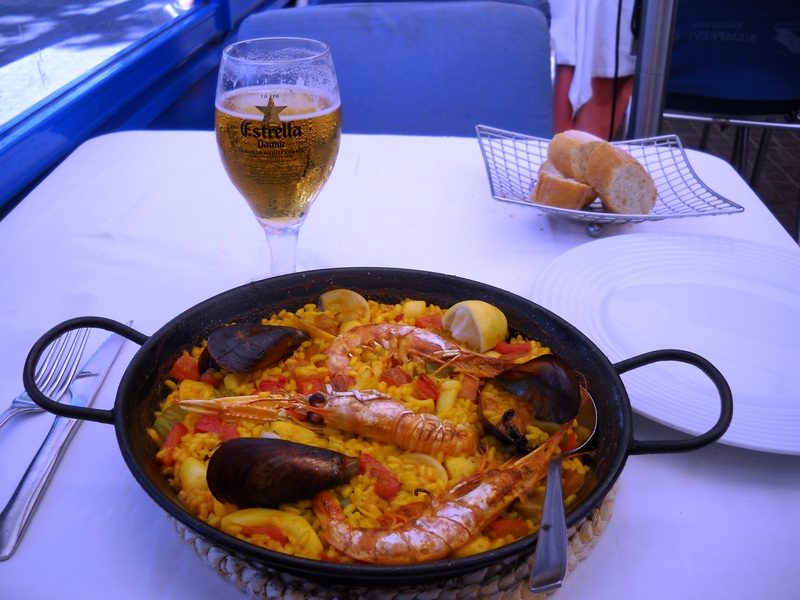 This outstanding meal, seafood paella and a beer, cost 17 Euros, or less than $20. 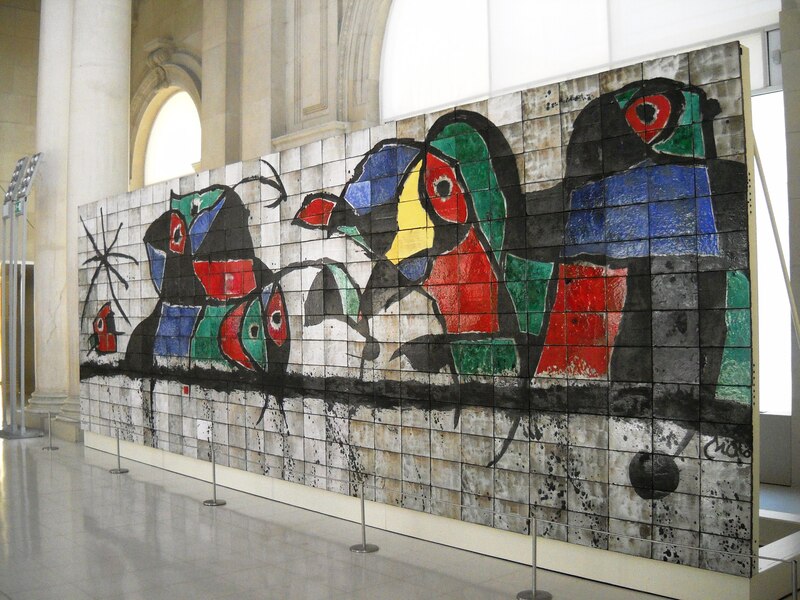 A Juan Miro mural from the National Museum of Art. 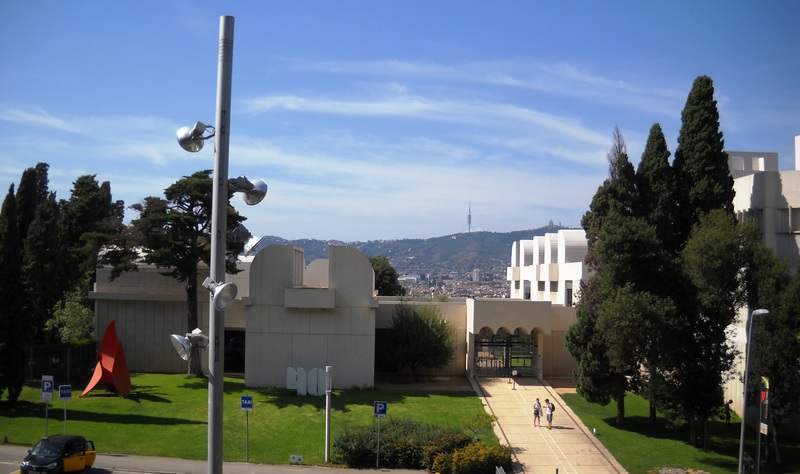 The entrance to the Juan Miro Foundation. Miro’s presence is strong; he even designed a bank logo. 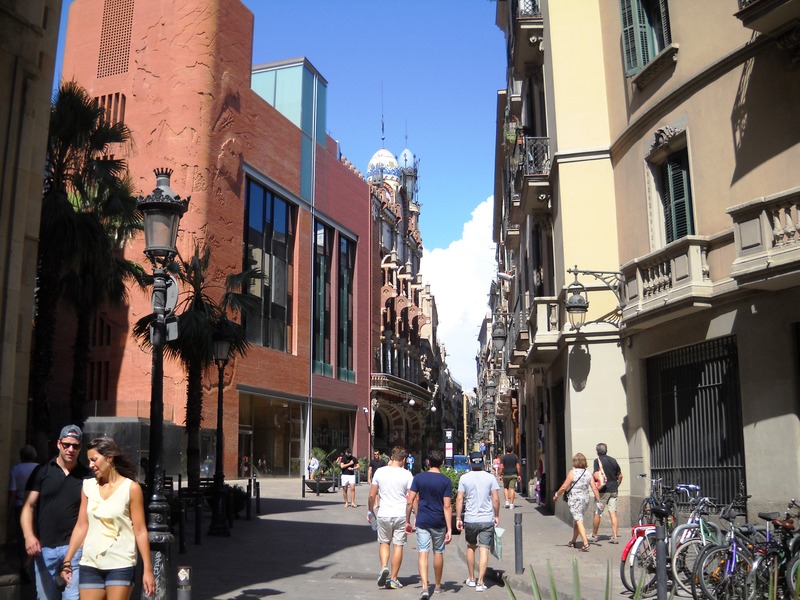 Now it’s your turn: Do you have Barcelona memories to share?